MILWAUKEE, WI - In new reporting by Patrick Marley and Molly Beck at the Milwaukee Journal Sentinel, Scott Walker's spokesperson Brian Reisinger refused to confirm or deny whether Walker is the political candidate referenced in an FBI agent's affidavit related to the indictment of Russian operative Maria Butina. Reisinger further refused to confirm or deny whether members of Walker's staff have been contacted by the FBI in relation to Butina, although he denied that Walker was personally contacted by the FBI. 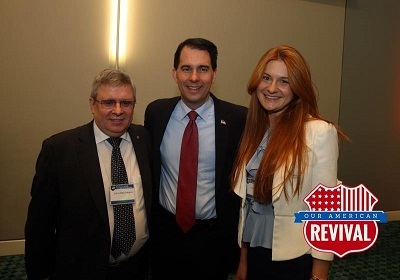 "Walker met the woman, Maria Butina, at a National Rifle Association meeting in 2015 as he prepared to launch his short-lived run for the GOP presidential nomination. She later attended his campaign kickoff in Waukesha. "An affidavit from an FBI agent alleges a "Russian official" requested that Butina write a brief report about a political event she was to attend. The filing does not include the name of the politician or the names of groups she was allegedly trying to infiltrate. "The next day, Butina wrote a report that "included descriptions of her speaking to a political candidate on the night of the announcement, as well as Butina's previous private meeting with the candidate at the 2015 annual gun rights organization members' meeting." Reisinger did not say whether that portion of the affidavit referred to Walker, but noted it did not explicitly name him. Yesterday, Walker declined to take a position in response to a question about Trump's joint press conference with Putin in Helsinki, during which Trump sided with Putin over the US Intelligence Community. "Now that we know Scott Walker met with a Russian operative seeking to infiltrate our politics, Wisconsinites are asking for transparency from Walker. The public deserves a full accounting of any other meetings he held with Russian nationals or other foreign interests in the lead-up, during, and following his presidential campaign. Walker must disclose all foreign contacts he made immediately. Walker must further explain the $1 million his PAC took from Russian oligarch Len Blavatnik, any commitments that were made in exchange for that money, and what access Blavatnik or other foreign nationals were granted to his campaign following or leading up to the donation. "Walker refused yesterday to condemn Donald Trump's press conference with Vladimir Putin, which John McCain called 'one of the most disgraceful performances by an American president in memory.' Wisconsinites deserve to know that they have a governor who will put their interests ahead of any foreign interests, and that their governor will stand up to anyone who is looking to interfere in our free and fair elections."